Stage has been set for rapidly increasing digital literacy in the country. In three years time the Government aims to take digital literacy to atleast 50 per cent from the current level of 15 per cent. 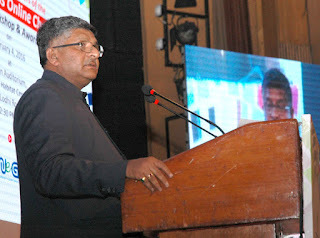 Minister for Telecom and Information Technology, Mr Ravi Prasad said this here today while presiding over the function to award winners of “Digital India Week’s Online Quiz Competition on Cyber Safety and Cyber Awareness”. He said 100 per cent digital literacy was needed to make India a truely digitalized society. Mr Prasad said that World is keenly watching developments in India and it is the responsibility of the youth to come upto expectations. He said more than 4,000 innovators have come to India to explore possibilities in the fields of Information Technology and electronic manufacturing. He said knowledge economy will prove to be the driver of change and initiatives of the Government in this direction would place in a certain advantageous position. As part of this initiative, the Government in collaboration with Intel organised an Online Quiz Competition on Cyber Safety and Cyber Awareness during the Digital India Week from 1st July 2015 to 7th July 2015. Around 10 lakh students participated in the competition from all 36 States /UTs. The competition was conducted for school children of class 6 to 8 and for class 9 to 12. The whole contest was online and the automated system recognized the correct answers and selected the winners. Around 32,000 students, who completed Level 2 of the competition, received their merit certificates online. Four top performances from each State/UT were chosen winners. Prior to the Award Function in the morning, a workshop on “Cyber Safety and Cyber Awareness” for school children was also conducted, wherein students were sensitized on Cyber Safety. Moreover, various topics including Cyber Bullying, Social Media misuse, Identity theft, Hacking, Mobile crimes, eFrauds, etc. were also discussed. At the end of the workshop, participating students developed action points for promoting Cyber Safety and Cyber Awareness in schools. This award function would further promote awareness about Cyber Safety contributing to the overall vision of Digital India that is ensuring safe and secure digital world especially for school children.